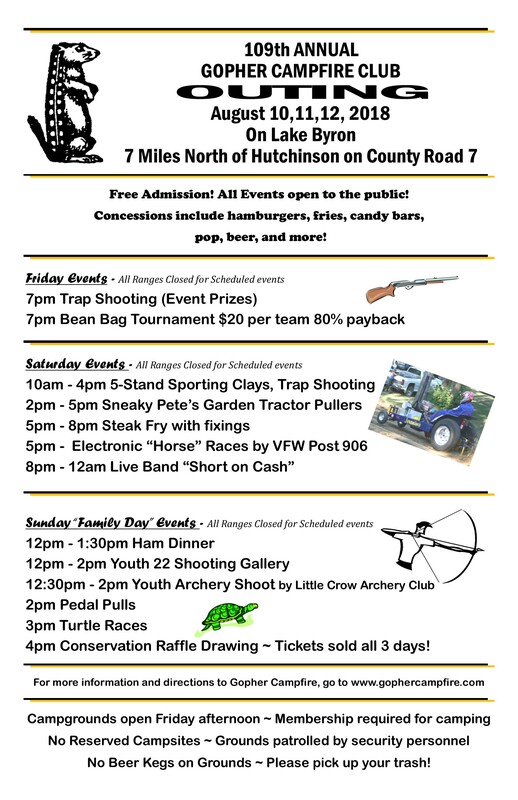 The 2019 Gopher Campfire Family Fishing Contest is in the books for another year. The weather was a little rough in the morning, but it turned out to be a fairly nice day and those who attended seemed to have a great time. There were 165 trout caught with Cora Stumpf catching the largest weighing in at 2 lbs. 1 oz and the smallest weighing 2 oz. was caught by Brian Murphy. We’d like to thank everyone that attended and made this another successful event. Also, a Big THANK YOU to all the volunteers who worked hard before, during and after!!! Pictured here are Don Schroeder (right) and Mark Bening (President). Don is the recipient of the 2018 Distinguished Service Award. The award is given out each year to an individual who volunteers and is willing to do the extra work for the club. 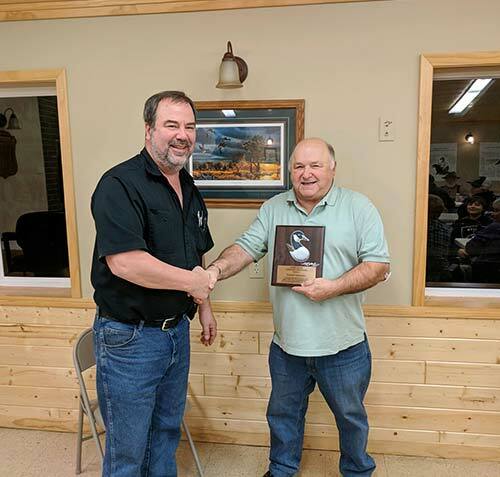 Don has volunteered for years with Sporting Clays, cutting wood for Bluebird day; he was a firearm safety instructor at Gopher for years and helps with other events when asked. The award was presented on January 9, 2018. At the monthly member meetings (second Tuesday of each month at 8 PM – except November) a dinner will be served at a minimal cost. The meal will be ready by 7:00 PM. The cost usually ranges from $3 to $5. The January 2015 member meeting will have a special meal of steak. The price for that will run a bit more at $10. Coveside Birdhouses has been nice enough to supply us with bird house plans for their popular Peterson bluebird house. Click here to view a PDF with the plans or see it and more on their website. If you would like to learn more about Coveside Birdhouses visit their website at http://www.coveside.biz/.